The new revolutionary Micro Mist repairs and rejuvenates your hair, giving strength, suppleness and a longer lasting shine. 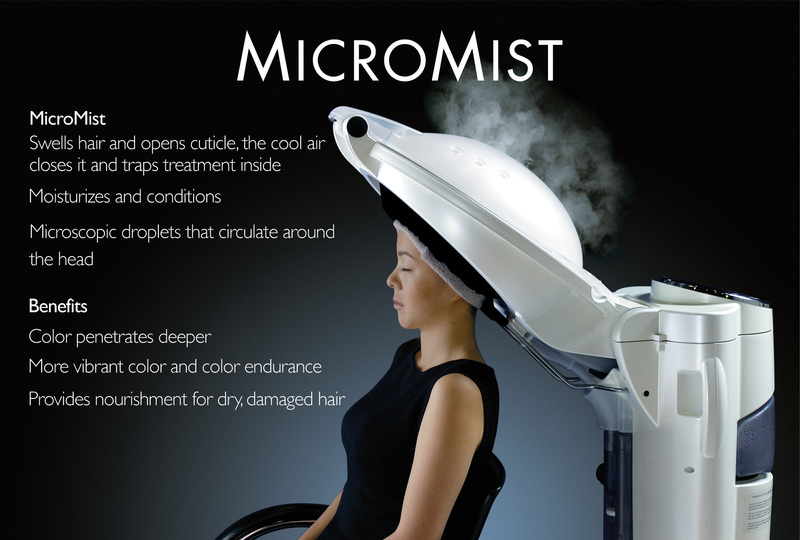 The Micro Mist, as its name suggests, uses mist (not steam) generated by ultrasound to process the treatment. This works in two ways: firstly, the particles of mist are much smaller and lighter than those of steam and therefore they can penetrate the cuticle of the hair to a greater depth. This means the Micro Mist pushes the product deeper into the hair where it is needed. Secondly, the Micro Mist has a cooling system that comes on at the end of each treatment, cooling the hair and closing the cuticle trapping the treatment product inside. This gives a much stronger and longer lasting results. Has your hair been damaged by sun, hair colouring, straightening or perming? As you probably already know most hair treatments don’t solve this problem. Micro Mist hair is a treatment that uses the power of water to penetrate deep into the hair. It swells the hair and enhances any treatments that you have had. The micro mist system comes to us from Japan and had been over a decade in the making. The treatment is locked into the hair. Convenient steamers boil water at 100 degrees to create steam. However the height of this temperature often causes more damage to the hair than it repairs. The micro mist system is different as it doesn’t steam water; it uses ultra sound to generate mist and warms it in accordance to your hair type; keeping the temperature far below 100 degrees. A treatment using the micro mist system usually lasts just over six minutes, in which time you have several minutes of warmth then a shot of cold, which is used to close the hair cuticles. This is how the treatment is locked into the hair. You walk out of the salon with silky smooth hair that can last between 7 and 10 days and a few weeks. Heating activates the molecular movement of treatment agents and water in hair. At the same time, heated micro mist swells the hair and enhances treatment agents permeate deep into each hair. Cooled air sent from the fan draws vaporized heat and rapidly soothes the molecular movement that has been activated by heat energy. This action reinforces fixation of treatment agents to the inside of damaged hair. By circulating a large quantity of mist in the hood where the temperature is excellently controlled, the entire hair evenly receives heat energy. Each hair gets a treatment effect and retains moisture, resulting in healthy and youthful hair. The Micro Mist system repairs and rejuvenates your hair, giving it strength, suppleness and a longer lasting shine. If you are hoping to take advantage of the great benefits the micro mist system has to offer then get into with your salon today as this treatment is unique to salons and can’t be done at home, unless you have over £2,000 spare that is! The micro mist system creates a smooth and relaxing sensation for the customer while at the same time provides effective treatment for dry and damaged hair. The micro mist system is said to be the most effective treatment for damaged hair so book your appointment today.